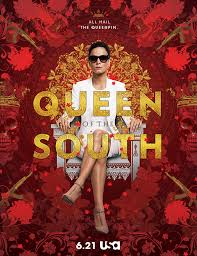 Queen of the South (USA) Rated TV-14 | What to Watch. Teresa’s on the run after her drug runner boyfriend is murdered. She ends up in Spain where she becomes the country’s top drug smuggler. Based on the telenovela, La Reina del Sur and a book by the same title written by Arturo Perez-Reverte. Starring Hemky Madera, Veronica Falcón, Adolfo Alvarez, Samantha Cantu, Alice Braga. I was pleasantly surprised by this show. It is both well-written and well-acted. I have to say, I didn’t expect this level of quality from USA; they do have some good programming, but this show is exceptional. If it continues as it has begun, this will be a show you don’t want to miss. It is worth a watch. This entry was posted in 2016, action, Based on a novel, Crime, Drama, Rated TV-14, reviews, Thrillers, Tv shows, USA Network and tagged acting, Adolfo Alvarez, Alice Braga, Arturo Perez-Reverte, based on the book, based on the telenovela, books, boyfriend, country, drug, drug smuggler, Hemky Madera, La Reina del Sur, murdered, Queen of the South, runner, Samantha Cantu, Spain, Telenovela, top, trailer, TV series, Tv shows, USA, Veronica Falcón, worth, written. Bookmark the permalink.